Google screenshot shows ‘Unplanned’ listed as ‘Drama/Propaganda’. Daily Signal senior writer/producer Kelsey Bolar posted a screenshot on April 11 showing that Google had classified “Unplanned” as a “Drama/Propaganda”. “Who knew that ‘propaganda’ was a movie genre? Google once again exposing its gross political bias,” Bolar tweeted. Al Gore’s “An Inconvenient Truth” is listed as “Documentary”. Michael Moore’s “Fahrenheit 11/9” is listed as “Political cinema/Documentary”. Nazi propagandist Leni Riefenstahl’s “Triumph of the Will” is listed as “History/War”. A Google spokesperson told Fox News that the tech giant’s “Knowledge Graph” analyzed web content on “Unplanned” and that a large volume of it described the film as propaganda and placed the label without a universal consensus. “When we’re made aware of disputed facts in our Knowledge Graph, we work to fix the issues, as we’ve done in this case,” the spokesperson told Fox News. 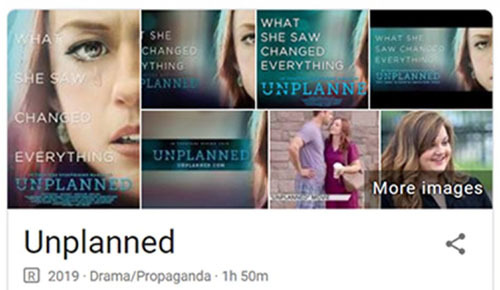 Google updated the search results so that “propaganda” no longer appears as the genre for Unplanned. In March, fans of the movie accused Twitter of unfair treatment after the social media platform briefly blocked the film’s account. Even though critics say Twitter’s move cost the movie followers, Unplanned still has more followers on the platform than Planned Parenthood. Not surprisingly, Unplanned received terrible reviews from corporate media film critics. It received rave reviews from most who saw it in theaters. Unplanned was produced independently of the Hollywood studio system, and was supported financially by Christian conservative icon Mike Lindell, the inventor and CEO of MyPillow. That the film “even made it to the big screen is a small miracle in itself,” White wrote. “The entire liberal entertainment industry mafia banded together with their friends in the business world to thwart this little movie that could. “Why? Because if there’s anything Hollywood hates, it’s people who dare to question the liberal orthodoxy that now undergirds even the most apolitical-seeming studio films today. Those who question that orthodoxy are risking their careers. Since opening, Unplanned has made over $12 million at the box office.